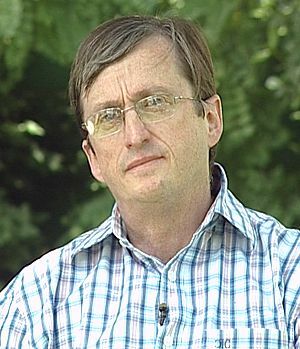 Hilton Ratcliffe is a South African-born physicist, mathematician, and astronomer. He is a member of both the Astronomical Society of Southern Africa (ASSA) and the Astronomical Society of the Pacific. He is prominently opposed to the stranglehold that Big Bang theory has on astronomical research and funding, and to this end became a founding member of the Alternative Cosmology Group (an association of some 700 leading scientists from all corners of the globe), which conducted its inaugural international conference in Portugal in 2005. In 2008, he joined The Natural Philosophy Alliance. He was a member of the Conference Organising Committee for the Second International Crisis in Cosmology Conference held in Port Angeles, Washington, in 2008, where he was also a keynote speaker. Hilton has been frequently interviewed in the press, on television and on radio, and has also authored a number of papers for scientific journals. He writes a monthly astrophysical column for Ndaba, newsletter of the Astronomical Society of Southern Africa, and edits the online newsletter of the Alternate Cosmology Group. He is best known in formal science as co-discoverer, together with eminent nuclear chemist Oliver Manuel and solar physicist Michael Mozina, of the CNO nuclear fusion cycle on the surface of the Sun, some 65 years after it was first predicted. In his capacity as a Fellow of the (British) Institute of Physics, he involves himself in addressing the decline in student interest in physical sciences at both high school and university level, and particularly likes to encourage the reading of books.